← How to analyze PDF format and extract text and images separately? Question:I'm tasked to come up with a way to render PDF forms on devices and give the user the ability to fill out these forms. 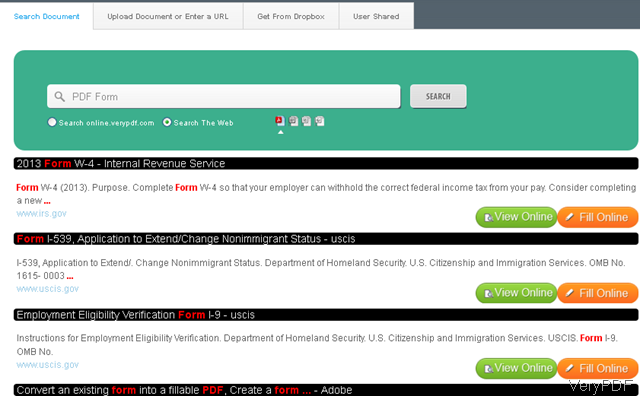 Once the form is completed, the user can then push a submit button and the form will be sent to a web service. Is this feasible? Has any of you used any 3rd party tools that would alleviate this task? Is there any solution on VeryPDF? Answer: According to your needs, maybe you can have a free trial of this application: VeryPDF Free Online PDF Form Filler, by which you can give the user the ability to fill out these forms. You can put some PDF form on website then the users could search them. And then once users fill the PDF form, they can save one themselves. Or if you need one copy, you can let the user send you the link of the filled PDF file. This application is totally free, so you do not need to redevelop a new application at extra money. Please check more information on homepage, in the following part, I will show you brief steps to finish this task. This application provides totally free PDF search engine, by which you can search PDF easily and directly. The following snapshot is from the search engine website, please have a check. By this function, you just need to tell the user of the PDF form. Simply input the searching keyword and press SEARCH then you can get the list of searching PDF result. After finding the searching result, simply click button View Online then the users could view the PDF form directly. This method is also be good for searching any kind of documents and then view it online directly. 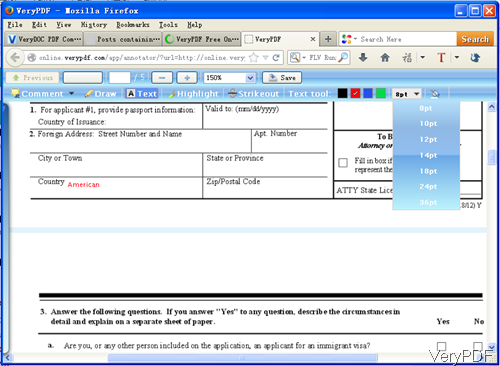 If you need to fill PDF form, simply click button Fill Online, then you can fill PDF form now. The following snapshot is from the filling website, please have a check. When fill PDF form, please click button Text then you can add text to PDF easily. When clicking text, you can choose text color and text size. Please position the place of the text then input, the text could be added there. Step 2. Check the fill PDF form effect. When you finish filling, please click button Save then there will be a link produced. By the link you can open and download the PDF file at any place. So the user could back up one copy. And link could be more easily send and saved. Now let us check the filling PDF form effect from the following snapshot. How to extract pages from PDF without computer system limitation? How to combine PDF eBook from multiple into one? This entry was posted in VeryPDF Cloud API and tagged fill PDF form. Bookmark the permalink.